HomeMaccaferri Malaysia recently won the award from the BrandLaureate in the category Corporate Branding – Best Brands in Engineering: Erosion Solutions. Maccaferri Malaysia recently won the award from the BrandLaureate in the category Corporate Branding – Best Brands in Engineering: Erosion Solutions. Maccaferri is proud to announce that Maccaferri Malaysia has won the award in the category Corporate Branding, for the Best Brands in Engineering and Erosion Solutions by The BrandLaureate. The BrandLaureate is a branding foundation with the aim to improve branding practices and standards throughout the world. 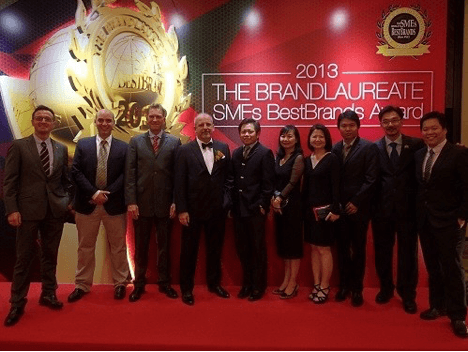 The organization, in conjunction with the Asia Pacific Brands Foundation organizes the BrandLaureate Awards. The award is given following the world class achievement in branding amongst companies as well as individuals. The BrandLaureate Awards are given in three main categories: corporate, product and individual. Maccaferri Malaysia has won the category “Corporate Branding” for the Best Brands in Engineering and Erosion Solutions. The Maccaferri Malaysia team collected the awards on January 21st at the gala dinner in Kuala Lumpur. This recognition is the result of all the great efforts of the Malaysian subsidiary in their marketing activities. Maccaferri Malaysia has built its presence throughout the East Asian construction industry, promoting the range of Maccaferri solutions through its involvement in the high profile projects in the area such as the River of Life in Kuala Lumpur and the Downtown Line 3 Metro, Singapore. This has been through numerous seminars, advertisements, sponsorships and presentations.